Earlier this month, my boyfriend, Hunter Reams, visited me in Paris and we explored France, Hungary, Austria and Switzerland. We experienced new cities together and had adventures of a lifetime! From meeting locals through AirBnb, to experiencing our first night trains, to enjoying cuisine from menus that we didn’t understand, to walking miles through historic streets, to exploring art and culture museums, to sipping coffee (or wine 😉 while people-watching and enjoying the breathtaking views, I am so grateful to have had the opportunity to travel with Hunter during our busy and budget-conscious graduate student lives. Since it was Hunter’s first time visiting continental Europe, I thought it would be interesting to capture his perspectives of Europe as a mid-2os American. Thank you, Hunter, for sharing your perspective of our story and your candid thoughts! Everyone dreams of traveling through Europe. If you have not visited, Europe is that magical land that you have quickly scrolled through on Facebook on your friend’s endless Facebook pictures. Well, having recently returned from a 2-week trip through France, Hungary, Austria, and Switzerland for the first time, I am now one of those Facebook picture posters. That is because Europe is beautiful. A land of beauty in a way that I truly did not know existed. Besides losing all hope of sleeping on my plane, due to a baby in close proximity, everything about my trip was incredible. From my first moments in France, traveling through the suburbs to reach downtown Paris, I could tell that this would be an adventure of a lifetime. Several times throughout the taxi ride I compulsively exclaimed: “Wow, look at that cathedral,” “Everyone is so slim,” “The cars are so small,” “This neighborhood reminds me of D.C.”. Never before had I felt so far away from home, yet things did not look all too unfamiliar. I think that my major theme from my trip comes down to exactly that: It is another world over there – so much history, conflict, and culture. But also, it also showed me that we live in a small world. I saw shops and restaurants that originated in the U.S., next to 1,000 year old historical monuments from early human empires. It was definitely a cultural dichotomy. Strasbourg, France: Simply put, Strasbourg was amazing. I visited Strasbourg for a day and a half with Brittany and one of my best friends and would love to go back again. Strasbourg was a city that seemed like something out of a movie. While on the walking tour, I noticed that literally every building looked like it was from the year 1400. Additionally, it is on the border of Germany and France – so both cultures are seen throughout the city. I enjoyed German-inspired French food at historic taverns. But the most distinctive and memorable part of Strasbourg was the Cathedral. This mammoth of a church dots the skyline in the center of the city and is truly one of the most breathtaking buildings I have ever seen. Strasbourg is a hidden gem that I would recommend for anyone traveling through Europe. 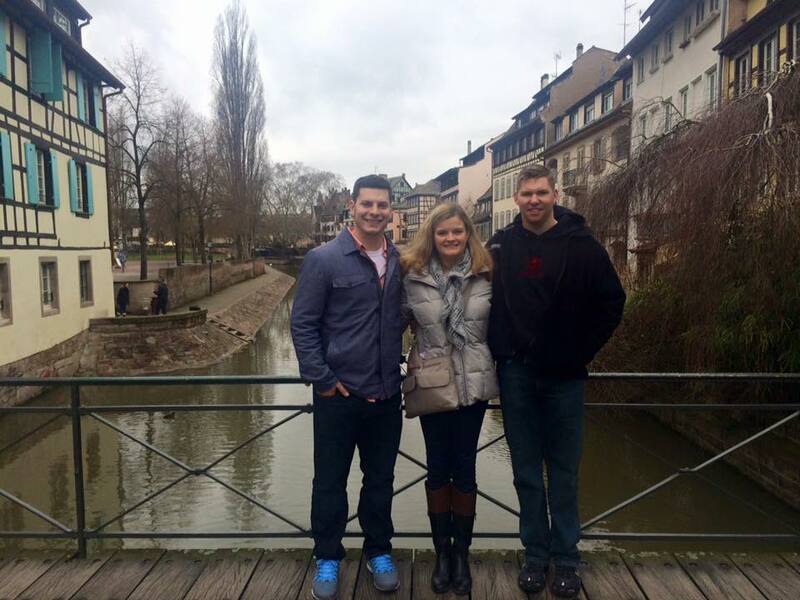 Exploring Strasbourg with Brittany and one of my best friends, Nick! Budapest, Hungary: Budapest was definitely my wild card coming into the trip and it was one of our most exotic experiences. Brittany and I flew into Budapest and were picked up by our Airbnb host. Not only was our rent a mere 31 Euros a night, but our host Victor drove us home from the airport and all around the city. I am telling you this because one of my most resonating impressions of Budapest was that the Budapest people were incredibly friendly! I felt like everywhere we went in Budapest we would run into people that were nice, helpful, and overall just happy people. Now, I think Brittany and I were given a particularly accurate view of Budapest because we accidentally booked our Airbnb in the middle of the Jewish Ghetto…(I swear the description said “city center”). While we were not too thrilled at the prospect of staying in a poor part of the city, it actually ended up to be a real blessing. We walked all around areas of Budapest that were not meant for tourists and saw the lingering effects from WWII and the Nazi control of Hungary. Now that being said, Budapest is gorgeous and has probably the most beautiful riverfront that I have ever seen. The rolling Hungarian hills line both sides of the river with beautiful and historic buildings. 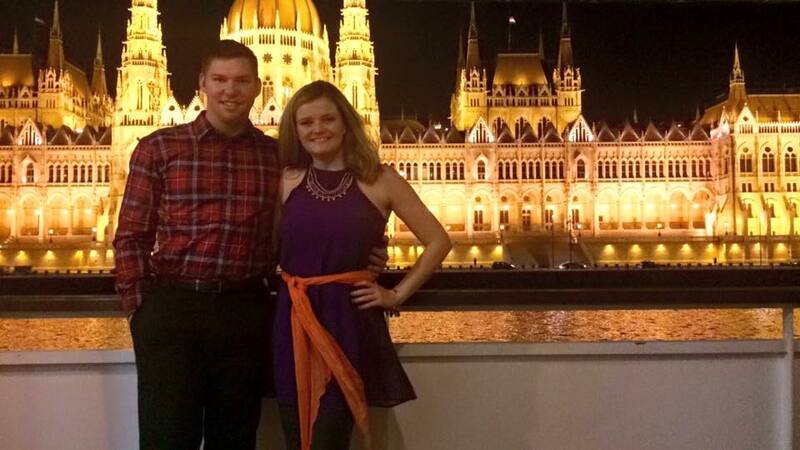 The best decision Brittany and I could have made was to do the Danube river cruise. We enjoyed a full buffet dinner for a reasonable price, met great couples from England and Argentina, and had the perfect view of Budapest and its riverfront! After the river cruise, we wanted to experience the famous Budapest nightlife. Coming from Paris, where the bar scene was not as active, Budapest made up for it and then some! Brittany and I decided to go to a “ruin” bar, which is essentially a bar that is in a really old building and has all sorts of interesting and old objects throughout. For example, Brittany and I had drinks while sitting in a bathtub! With several floors, outdoor seating, happy bar-goers, and almost all 90’s American Music, it was designed for a great time. Brittany and I love 90s music so that was an unexpected plus! Salzburg, Austria: Salzburg is a city that is more significant than some people may think. It is the birthplace of Mozart, home of the Sound of Music, and was an important military outpost with the oldest and best-preserved military castle in Europe. Salzburg was clean, historical, gorgeous, and it had a very unique and cool vibe. Brittany said it was her favorite city of our trip and I can definitely see why. When I think back to Salzburg, I picture myself walking around the city with the beautiful mountains surrounding the valley, and I think of all of the brightly colored shops and historical monuments all around. Although we only had a day to spend in Salzburg, the beauty of the area has stuck with me. On top of that, the food and drinks were delicious as well – we enjoyed weinerschnitzel and local beer on our first night! I will also never forget our last night in the city. We went on the Sound of Music tour and saw all of the famous settings from the Sound of Music. We then went to a beer hall – connected to a church for some reason – and drank beer with other Michiganders we bumped into at the hall of probably 1000+ people. We drank for a few hours, drinking out of the same big mug, washing it out with water, and getting it refilled from a keg, (like good Germans). After we both had our fair share of beers, we stumbled around Salzburg, went to another bar, ate burgers and fries (like good Americans), and then hopped on our 2:30am train and headed to Switzerland! Bern, Switzerland: I look at Switzerland as a place that does everything the right way. 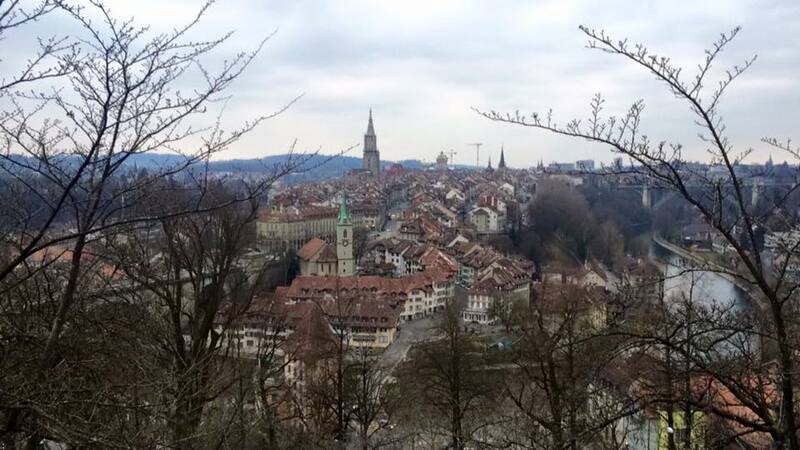 Bern is so beautiful, historic, charming, and really encompasses the beauty of Europe in one city. Yet at the same time, Bern is modern. Public transportation is the main form of transportation. The buses, trolleys, railways, were all modern and sustainable. People walking everywhere or riding bikes. And the culture blended several influences from France, Germany, and Italy all in one place. It was the ultimate melting pot in one of the most beautiful locations I have ever seen! At this point in our trip, Brittany and I were definitely a bit exhausted after 4 days of non-stop travel. Bern was the perfect place to relax. 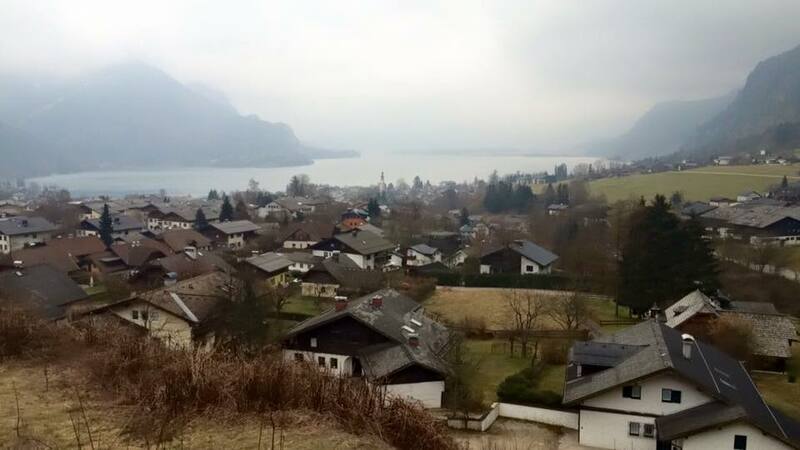 We walked all around the city, climbed to the top of a hill and witnessed one of the most beautiful views I have ever seen, and enjoyed some Swiss fondue. Definitely a great place to visit! On our way to dinner at Rosengarten, overlooking all of Bern! Paris, France: I spent the majority of my time in Paris. 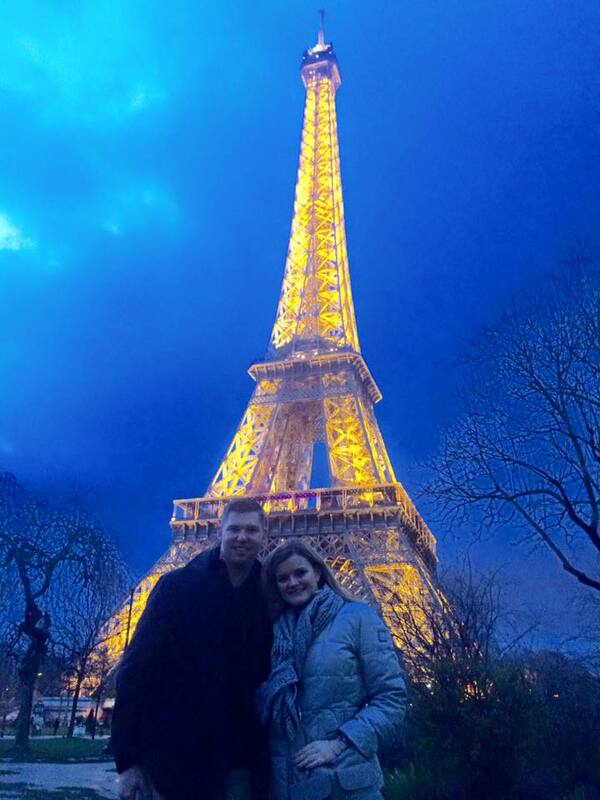 Luckily, I was able to spend it with Brittany in her host family’s apartment and experienced a more accurate picture of Paris – not one as just a tourist. When I think of Paris, one word comes to mind: “grand.” Paris was so grand. Every building, all of the people, the food, the culture; it was all so beautiful and so detailed. I was fortunate to have enough time to visit all of the major attractions: I stood on top of the Eiffel tower, looking over the beauty of the city from a bird’s eye view. I saw Notre Dame, explored the exhibits of the Louvre, enjoyed wine and cheese at Montmarte, wandered around the incredible Palace of Versailles, and shopped along Champ-Elysees (I bought my new work bag that will be a great memory while I am interning this summer). I ran along the Seine River and enjoyed an evening picnic at Pont des Arts (like a typical Parisian – I carried wine and cheese in my backpack during my run and Brittany was very grateful :)). I spent mornings studying at the coffee shops and people-watching while Brittany was in French class. I shopped in Galeries Lafayette and enjoyed famous pastries at Cafe Angelina with Brittany, observing a level of affluence and eloquence that I had never experienced before. Paris is a city that is too surreal for words. Even in the outer portions of the city, the detailed buildings and quaint shops made it all so cool. Paris had it all. The public transportation is excellent and the cleanliness, history, and modern conveniences make Paris a city that really represents the best of the Western World. Admittedly, I will concede that I was a bit disappointed with the Parisian nightlife, culinary scene, and the pompous attitude of quite a few French people. But the overwhelming beauty and history of the city more than made up for it. I am not exaggerating in saying that Paris is a city that everyone needs to visit! Beautiful, sparkling Eiffel Tower at night! Overall: Europe was an amazing place that gives me both faith in humanity and faith in our planet. I explored a continent that combined the best of both worlds: historical culture and a progressive sustainable society. People were in shape and stylish. People I met were knowledgeable, and understood history and the melting pot of cultures throughout the world. People were aware of American issues and I had some great debates with Europeans about the current state of American politics. The cities were all clean and safe. If I had to point out any cons to Europe, it would be that the food and drink portions are too small (as a pretty big guy I had to make an adjustment). But other than that, Europe really changed my perspective on the world and blew me away. I think that everyone should try and explore Europe to discover this world for themselves. Ultimately, as it did for me, I think Europe will give you a different perspective on life. A perspective that values history, the public society, and culture. I explored four countries that truly value providing for the public good, which I hope the will continue to inspire the U.S. I have learned so much from my time in Europe and I have now caught the travel bug. I can’t wait for the next time I satisfy my wanderlust and I greatly recommend any of the places I visited on my first of many Eurotrips! The Brussels attacks are again a reminder that we all need to stand strong against terrorism, stereotypes, and hatred towards others. My heart goes out to all those affected by the attacks and to the world, where at any moment, our lives can change drastically. With my past month of European travel, from Paris to Strasbourg, Budapest, Salzburg, Bern, and now to Lisbon, Salamanca, and Madrid, I am saddened and frustrated by the terrorists’ impacts on my daily thoughts about travel. Any tourist sites, airports, or public transportation options are threatened and instill fear for travelers. While I am going to continue to be cautious, I will not let fear control my life. I am writing this post from the Paris Orly airport on my way to Lisbon, which is proof in itself that I am staying strong and encourage other travelers to do the same. As I said in my One World 365 post, Why You Shouldn’t Let Terrorism Stop You From Studying Abroad in France, we must continue to live freely and happily, contrary to what the terrorists want. Education encourages me to think that it is possible to teach peace and understanding, especially if we as individuals make an effort to understand the world outside our own. Continue to travel, meet strangers, and explore the fact that there is more than one way to live and we can all learn from other lifestyles. Peace and safe travels to all inspirNational followers! $1500 flights, $150 hotel rooms, $50 day trips…cha ching! At a first glance, traveling throughout Europe seems impossible for someone on a graduate student budget. Historically, travel has been perceived as luxurious, reserved for the upper class. I’m here to tell you that your first glance and historical perceptions are now false. It is absolutely possible, now more than ever, to travel throughout Europe with limited funds! Consider your flight destination! While you may plan to travel in France, for example, it may be cheaper to fly into another country, such as Belgium, and then take a train to France. Use a map and think of creative ways to travel to your desired destination. Certain airlines also offer better deals, such as RyanAir for intra-Europe travel. Seek alternative lodging arrangements. Hotels are no longer your only option. I’m a big fan of AirBnB, which offers cheap lodging and also an opportunity to learn about the local culture by meeting a local host. My friends have also tried CouchSurfers, which is popular in Europe. Brush up your cooking skills and buy groceries! Restaurants are often the most expensive part of travel. You can be financially smart by buying groceries, making food at home, and packing snacks with you so you aren’t persuaded by the costly tourist concession stands as you wait in long lines for tourist attractions. Research free tour options in your destination. I am a huge fan of free walking tours, such as Sandemann’s, which give you a great overview of cities throughout Europe and tell you interesting facts that you wouldn’t otherwise know by just walking through the city. Avoid taxis – taxis love tourists and the possibility to upcharge you. Instead, use Uber, public transportation, or better yet, walk! By walking, you can people watch, become more aware of your surroundings, and enjoy some fresh air while you are traveling. Another popular ride sharing option in Europe is bla bla car, which I have yet to try, but have heard great things about its convenience and cheap prices! Bring a first-aid kit with common cold medications and other toiletries you often use at home. Medicine, first-aid supplies, and toilettries in some European countries can be more expensive than other countries throughout the world. You will also save time by not having to go to the pharmacy while you are abroad! Don’t buy souvenirs from tourist shops – prices are often increased for the guilty “gotta-have-it-before-I-leave-Rome” buyers. Instead, check out the stores on side streets or find out where the locals go. You are guaranteed to find better deals and something that more genuinely reflects your destination. On top of that, how many “I ❤ …” keychains and t-shirts do you really need? Take advantage of WiFi. Be sure to turn data roaming off your smartphone, and use WiFi to contact local friends and family at home. My favorite Internet-based calling and texting applications are WhatsApp and Facebook Messenger. Check tourist attractions for student discounts or age-related discounts. I have been reaping the benefit of mostly free museums because I am under age 26 (many European museums are free for those between age 18-25) and am a student! There are also special discounts if you have an EU visa, are a teacher, or work in public service. Tourist attraction websites usually outline these special discounts! Other travelers on a budget, what advice do you have? I want everyone to have the opportunity to travel Europe and throughout the world. For those of you approaching age 26, be sure to travel to Europe before it is too late to experience great deals while enjoying the most beautiful continent (maybe I’m a little biased) in the world!